Wear an Isabel Marant Crew Neck Short Sleeve T Shirt and a white lace pencil skirt for a hassle-free outfit that's also put together nicely. Black leather heeled sandals are a simple way to add a sense of sophistication to this look. The perfect foundation for relaxed style? 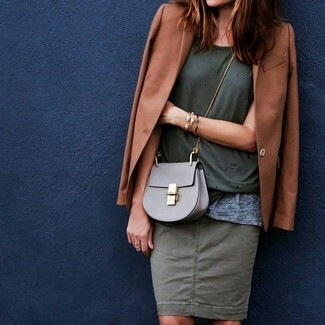 An olive crew-neck t-shirt with a black midi skirt. To introduce some extra depth to your ensemble, add tobacco cutout leather pumps to the mix. Go for an Isabel Marant olive crew-neck t-shirt and a black leather mini skirt to achieve an interesting and current off-duty ensemble. For footwear, stick to a more casual route with black embellished leather thong sandals. Rushed mornings require a straightforward yet seriously chic look, such as an Isabel Marant Crew Neck Short Sleeve T Shirt from TheRealReal and a black mini skirt. And if you want to immediately amp up your outfit with a pair of shoes, add a pair of black suede pumps to your look. 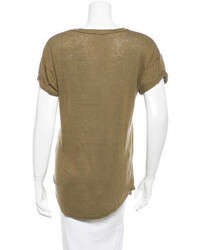 The combination of an Isabel Marant olive crew-neck t-shirt and black shorts makes for a killer laid-back outfit. An Isabel Marant Crew Neck Short Sleeve T Shirt from TheRealReal and a black mini skirt are amazing must-haves that will integrate brilliantly within your current casual routine. Black suede wedge sneakers will be a welcome addition to your getup. An olive crew-neck t-shirt and olive chinos are a nice combo worth having in your current off-duty collection. Complete this look with a pair of tan leopard suede pumps to spice things up. Why not rock an olive crew-neck t-shirt with blue jeans? As well as super comfy, both of these items look fabulous paired together. Olive suede pumps will infuse a bit of elegance into an otherwise straightforward ensemble. 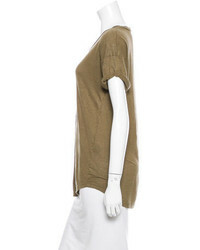 An Isabel Marant Crew Neck Short Sleeve T Shirt and an olive pencil skirt are a smart getup to keep in your current casual arsenal.